I am not known for my punctuality or organizational skills. I know you are absolutely shocked. Still, since knew I was going to be too late to get holiday cards printed and mailed off before Christmas or Hanukkah last year, I took a slightly unconventional step and made awesome New Year’s cards. Unfortunately, they're still sitting here in my office, under a stack of books. Whoops. This year is going to be different. This year, I will solemnly swear to design, print and mail holiday photo cards before the holidays. 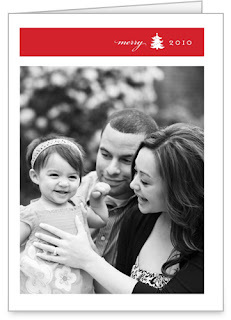 Shutterfly has lots options for personalizing the right card for your family. Personally, I lean toward the non-denominational cards since our family is all over the religious spectrum. This does create a little bit of mailing spread: Hanukkah cards need to be sent out before December 1st this year and we're already under the gun for Diwali, which starts on November 5th. If you're making Kwanzaa or Christmas cards you have a little more of a window since they happen in late December. My top three contenders at Shutterfly right now are Mod Snowflakes flat card, with its stark black background and bright snowflakes. It reminds me rather nostalgically of Colorforms. I'm also quite fond of the Vintage Plaid folded card. I love the faux engraved "Merry Merry!" and have always been a sucker for a red tartan. Very Alexander McQueen, RIP. My final top pick is the Little Tree folded card. I think this one combines modern and vintage really well. I also like the fact that the interior allows for many, many different layout options. You could print a couple of extra pictures to spotlight individual kids or pets, or even include a couple of paragraphs as sort of a de facto annual newsletter. The possibilities are pretty mind-bogglingly varied… Okay, maybe I need to stick to something simpler, personally. Are you a blogger, organized or not -so-organized? (I won't tell!) 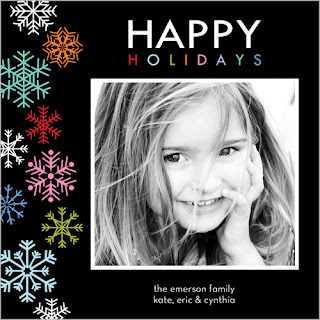 Do you want 50 free holiday cards from Shutterfly? Click here to go to Shutterfly for information on how you can get 50 free cards this holiday season, and make sure to select Clever 1000 as the referral source. I've been using Shutterfly for years. They have the best sales, and regularly give away free photo books, calendars and cards. Thanks for reminding me to order my cards now before it's too late!